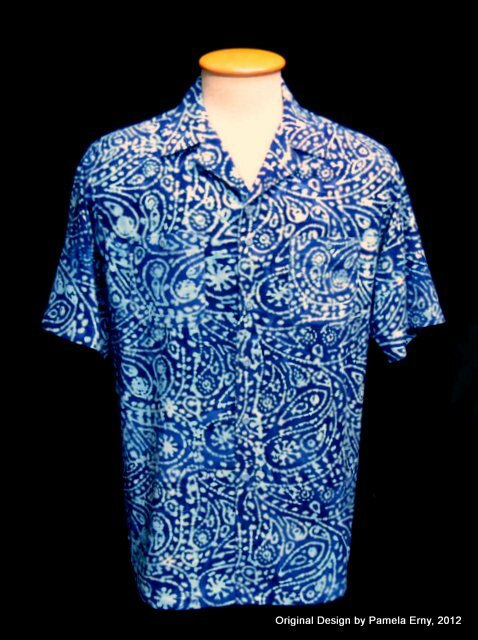 This is (almost) the last Batik shirt I'll be making for a favorite client of mine. and double top button spacing. Double top button spacing? What the heck is that? Notice that the top two buttons are spaced closer together than the others. This gives my client the choice of how far down he wants to "open" his shirt. Conventional button spacing would have given him only one (practical) choice for the depth of turn-back of the revers on this casual shirt. By adding an extra button, he can have the option of a deeper/lower turn-back. This is what "custom" shirtmaking is all about...giving the client options he cannot get off-the-rack, like custom sizing and double buttons. 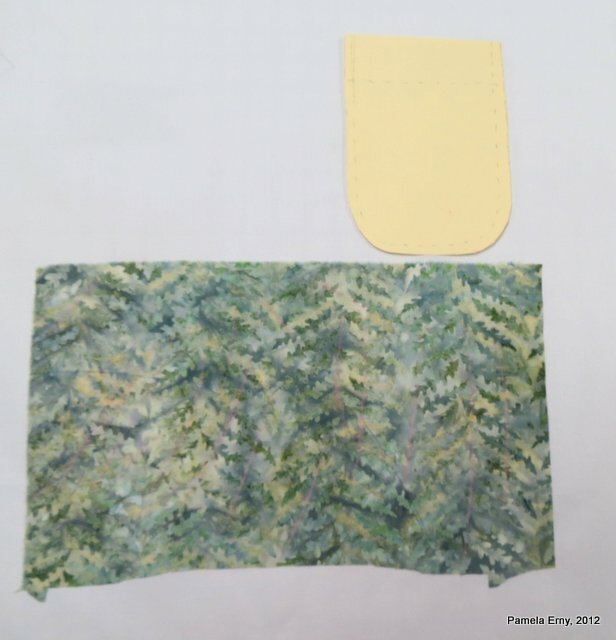 Another option that we have when we sew for ourselves or others, is customizing the pattern. 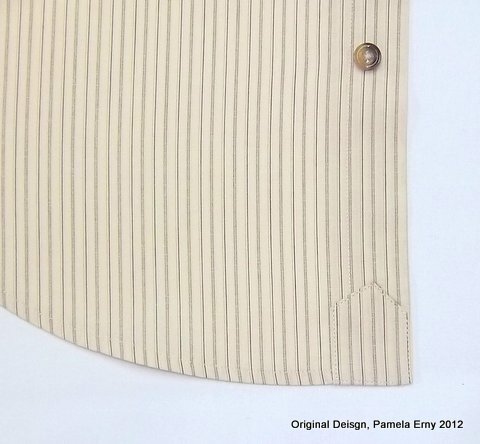 Some commercial convertible collar shirt patterns have a narrow front facing that looks something like the one marked "Pattern X" below. As shown, I draft my facing pattern for casual shirts of lightweight fabrics quite wide...especially at the shoulder and upper chest area. 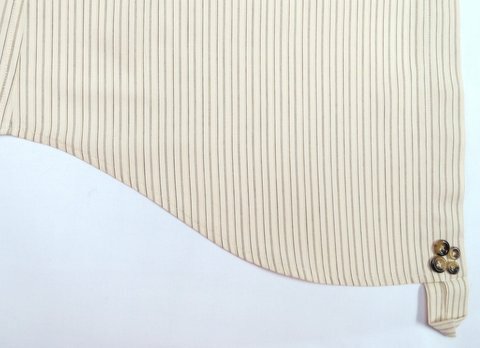 The reason I do that is so the facing edges do not show if my client chooses to open his shirt to the second button, or if he chooses to wear the shirt completely open the facings look like more like a design detail than just the "inside" of the shirt. The narrow pattern facing would have a tendency to show its inner edge, and just looks "skimpy"...again, in my opinion. Also, it is my opinion that a wider facing where it meets the shoulder line of the shirt makes the entire shirt-front stronger and more stable for men...who, let's face it, tend to put more "stress on the seams" of their clothes. The back yoke is completely faced...it's nice and strong, completely stable and ready to withstand the stress of wear. Of course, I cannot face the entire shirt front (well I could, but it's not practical for many reasons), but I can put more fabric at the shoulder and upper chest by making the front facing wider in those areas. This wider facing is perhaps a minor point. 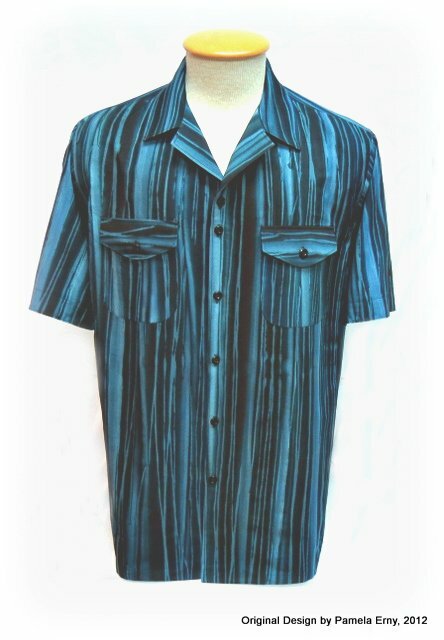 But it is small differences like these that make custom shirts different, and one of the reasons why there still is a market for custom-made apparel. 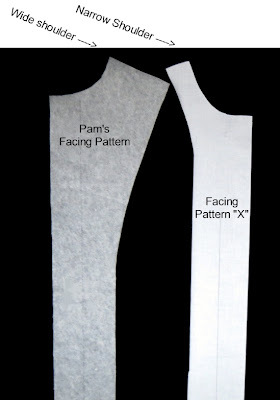 SEWING NOTES-- Front facings and both collar pieces interfaced with Pro-Sheer Elegance Fusible Interfacing from www.FashionSewingSupply.com. Black buttons from the "Dark Assortment" Buttons-by-the-scoop from www.FashionSewingSupply.com. Lightweight Cotton Batik fabric from www.Fabric.com. 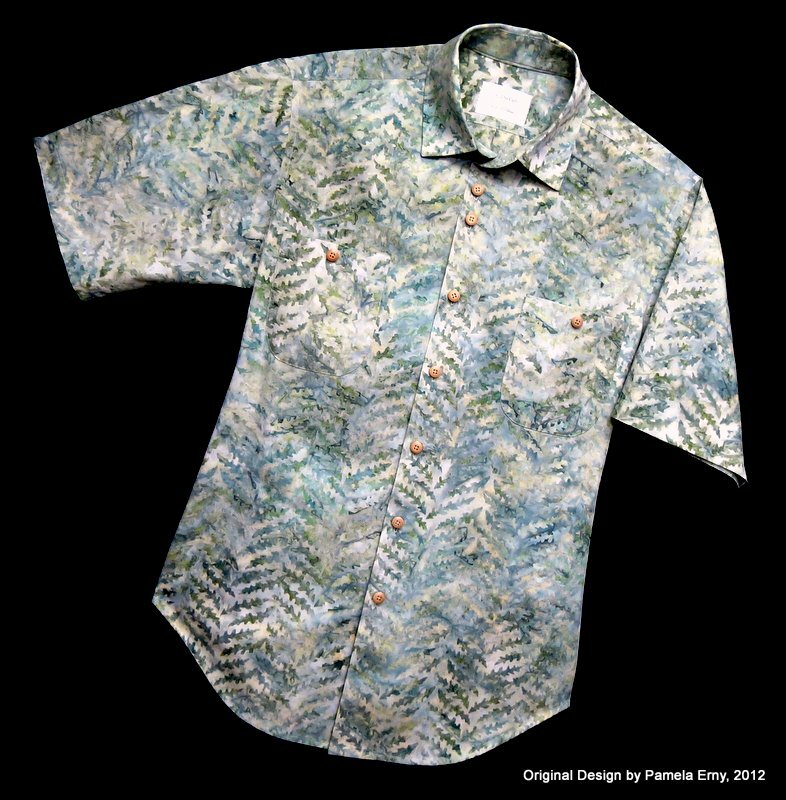 This is the latest in the parade of double-pocket Batik shirts I have been making for one of my favorite clients. Because of the busy print in variations of the same shade of blue, you can barely see any of the design details...and I apologize for that. But I wanted to show you the shirt anyway because I think the colors are so striking. I am stitching another shirt for this client today...so stay tuned for at least one more Shirt in this parade of Batik Madness! 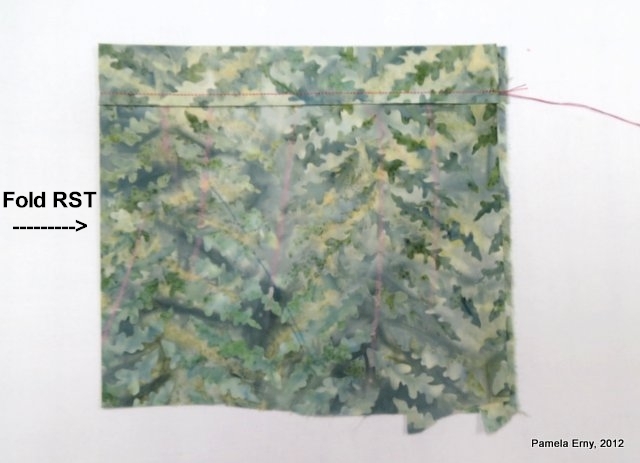 SEWING NOTES-- This fabric is a slightly heavier weight than the thin cotton batiks I usually use. 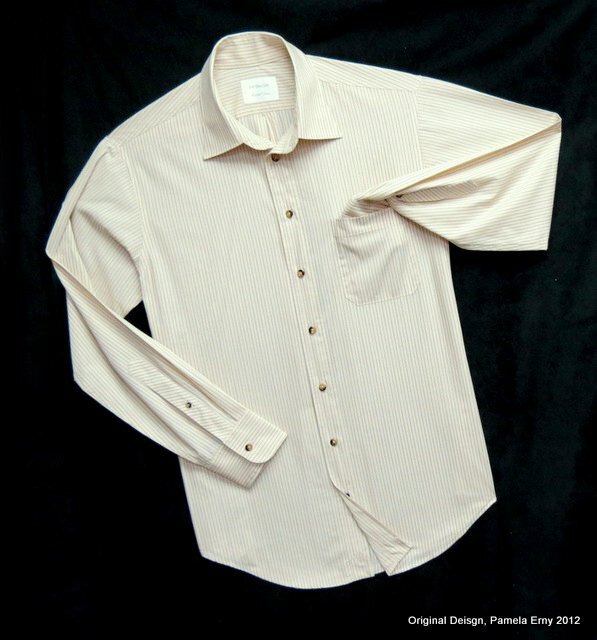 So instead of the Pro-Sheer Elegance Interfacing that I usually choose to interface these casual shirts, this one is interfaced with Pro-Woven Light-Crisp Fusible. 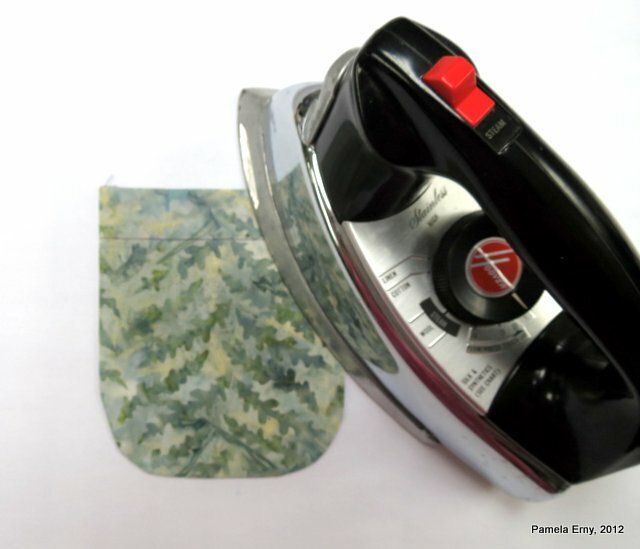 The buttons, and a wide variety of Professional-Quality Interfacings are available at my store, www.FashionSewingSupply.com (where we have substantially Lowered shipping rates ). Fabric is from my wholesale shirting supplier. At my studio we call them "Twin Pockets" if they are to be of identical shape...but getting them to actually be identical can be a challenge! 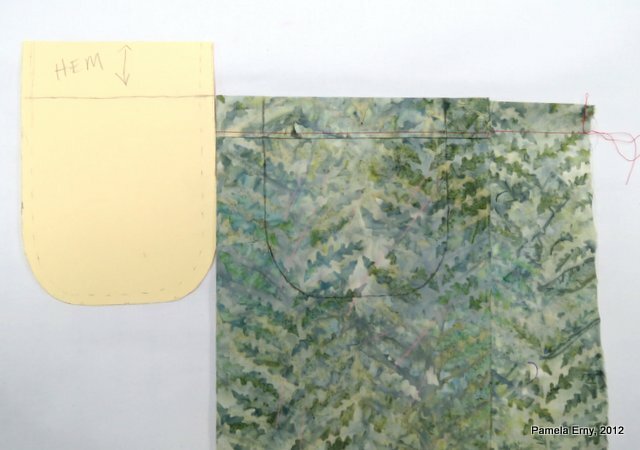 TIP-- this method is much easier to do if your pocket pattern seam allowance is 1/4". Make a copy of your pocket pattern and trim the seam allowances to 1/4" if needed. Then turn it again 1" to the wrong side and press. 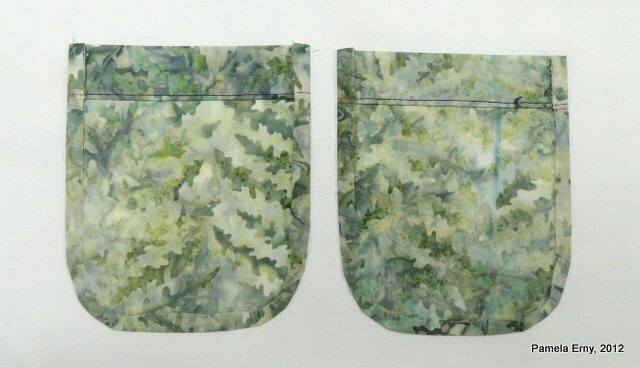 This gives a double-folded edge that will become the hem of both pockets. Next take the fabric to your machine, and stitch the top as if you were hemming a pocket (which actually is what is being done :) All stitching shown here is in contrast thread so it can be seen more easily...click any of the photos to enlarge them. So now we have a piece of fabric that has one straight edge that has been double folded and hemmed. The next step it to fold it in half, RIGHT SIDES TOGETHER, matching the top "hemmed" edges exactly. You will know that you have folded it correctly when the smooth side (right side) is inside the fold, and you can SEE the "lip" of the hem that was stitched (the wrong side). All that is being done here is folding the piece in half -RIGHT- sides together and making sure the "hemmed" edge is aligned along the top. 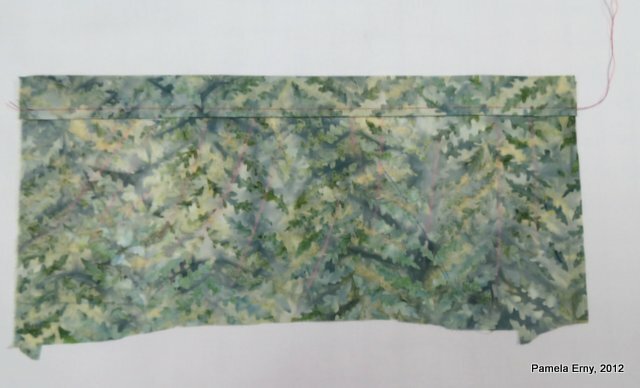 Now we need to make this hemmed piece of folded fabric into 2 pockets! 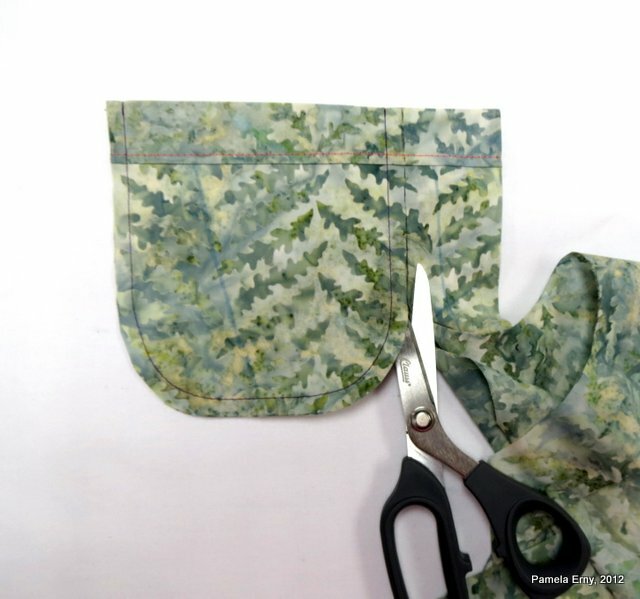 Position your pocket pattern on top of the folded fabric as shown below. 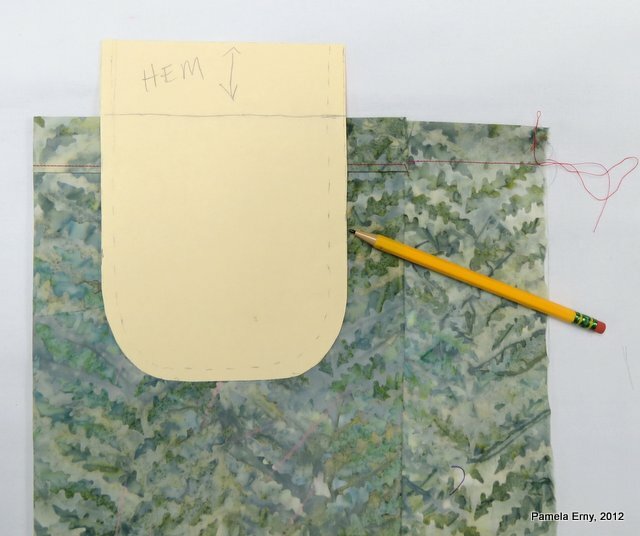 The fabric has already been hemmed, so the pocket is placed as shown...with the Hem allowance above the double folded (hem) edges. Remember, because the fabric has already been hemmed...the hem allowance of the pattern is NO LONGER NEEDED....so that is why it extends above the fabric. 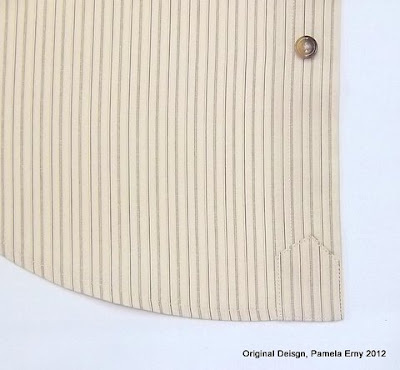 Now take a ordinary pencil, and trace all the way around the pocket pattern, as shown. 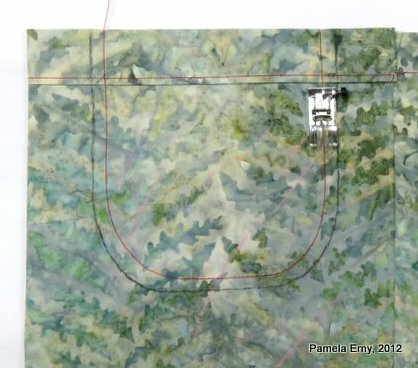 Now, carefully take your traced pocket to the sewing machine (you may place a pin or two to help keep the layers straight if you want to). LOOSEN THE Top TENSION OF YOUR MACHINE. Then with a regular stitch length...stitch INSIDE the traced line the width of your pattern's seam allowance. As you can see from the previous photos of my pattern, my seam allowance is 1/4"..so it's easy to use the edge of my presser-foot as a guide. 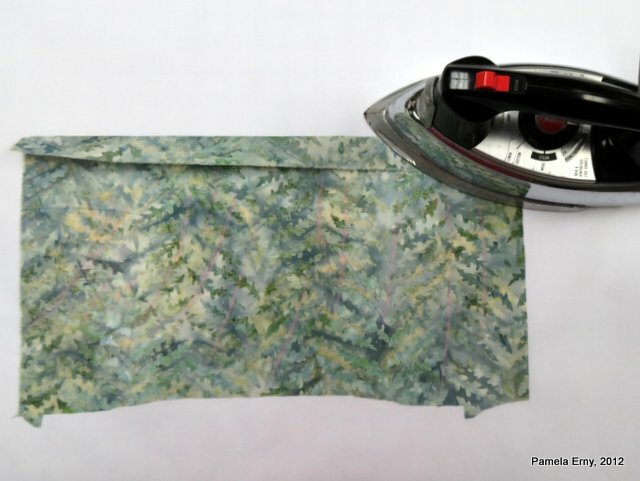 (Please read the TIP about seam allowance at the start of this tutorial). Next, remove the excess fabric around the pockets (remember, we are making 2 at the same time), by trimming along the PENCIL LINE. DO NOT cut the STITCHES! After the excess has been trimmed, we now have two pockets that have been loosely stitched Right Sides Together. The next step is to turn the unit right side out, and roll the seams between your fingers so that the seams are even along all the edges. Then firmly press the "joined" pockets. As you are pressing, the seam allowances (now inside) are being perfectly and identically pressed...no guess work...no tedious templates. After pressing, pull out the stitching that is holding the two pockets together. 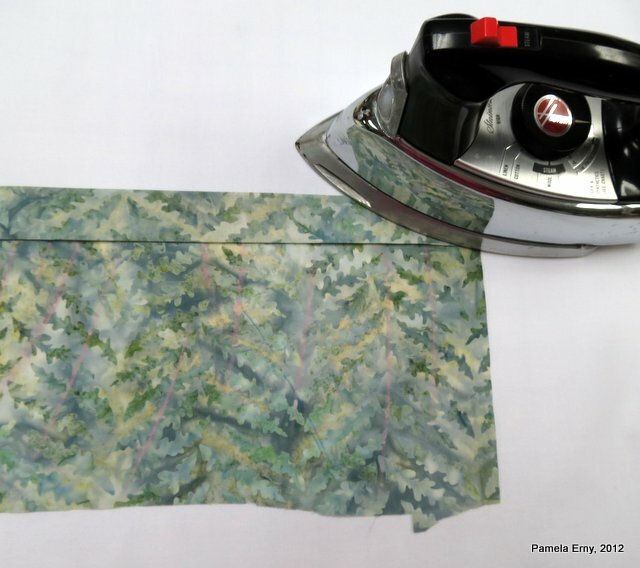 This should be easy to do...but if not, use a seam ripper to help separate the pockets. 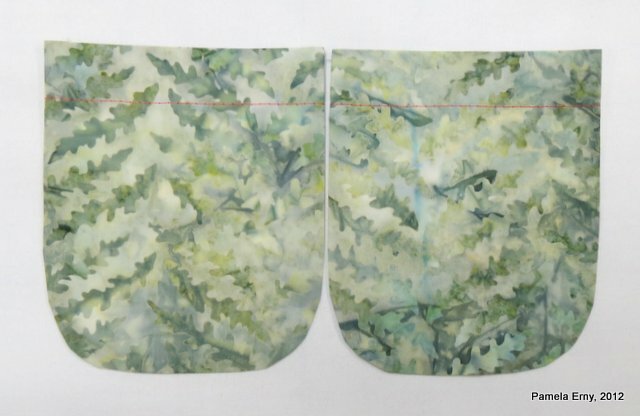 And this is what your pockets will look like from the right side...lovely and identical, already hemmed and ready to be sewn to your garment !